Need Detroit Party Bus Pricing? Detroit is the motor city. Even though they don't have the best economy they have quite a few party buses. Not counting shuttle buses there is around 100 party buses in the Metro Detroit area. 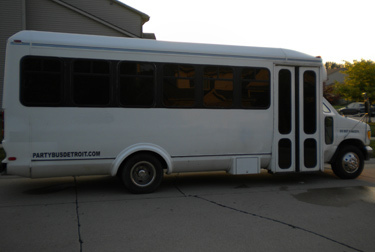 Pricing for party buses in detroit ranges from $70 an hour all the way up to $250 an hour. The price depends on the day of the week you need service and the size and quality of vehicle you need. Saturday is by far the most popular day of the week and the most expensive due to supply and demand. 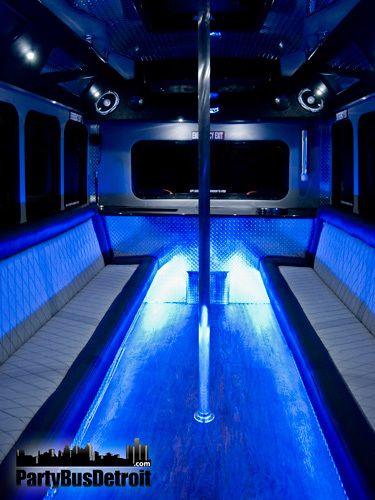 We talked with Party Bus Detroit to get some ideas on the price they charge. They had price anywhere from $75 to $175 per hour. They had prices slightly lower than the competition while still having quality vehicles. They are also licensed by the state of Michigan. Before booking a party bus with any company you should verify that they are licensed and insured. The state of Michigan requires $5,000,000 insurance in order to operate. Below you will find a few pictures of their vehicles and contact information. Whether you think of Detroit as Motor City or Motown, Detroit has played a major role in the development of American identity. Locals have seen a lot of change over the decades, but despite it all they continue to know how to have a good time. Party Bus Detroit has been helping the people of Detroit to see the fun side of life for years, and they continue to do so by offering fair and competitive pricing on their sleek vehicles. Arrive at a Pistons or Red Wings game with all your friends and gear by taking advantage of the services offered by Party Bus Detroit. Or get the whole gang down to the International Jazz Festival, Greektown, or the Windsor-Detroit International Freedom Festival to see the best that Detroit has to offer. 2015 © Copyright Party Bus Prices. All rights Reserved.